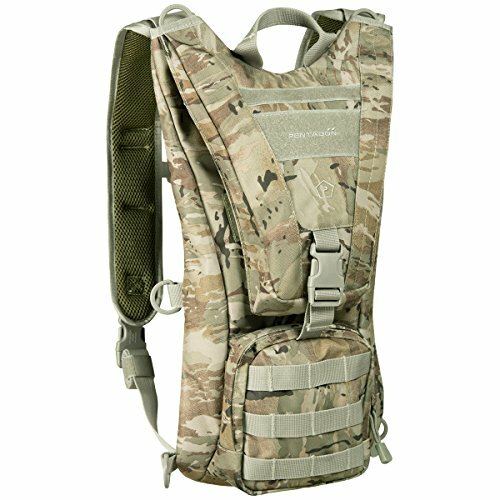 Sturdy and functional Pentagon Hydration 2.0 Backpack is lightweight and easy to use mission bag with a water supply delivery system. It features a padded main compartment with a zip side access and a water bladder with a quick refill cap. Moreover, there is a triangular, hook-and-loop secured flap at the front of the bag, over the round opening, providing easy access to the water bladder, and a small zip utility pocket with external MOLLE webbing for fixing additional accessories. Large padded pocket with hook-and-loop closing and pass-through bottom holes is placed at the back. The backpack comes with anatomically shaped, adjustable and padded shoulder straps with one D-ring each, adjustable chest strap with integrated emergency whistle, adjustable waist strap, 3D mesh padded back and long-lasting top grab handle. Two further D-rigs at the back allow the pack to be attached to any MOLLE vest while the opening at the bottom of the rear pocket is ideal for fixing the tactical belt offering additional stability. Pentagon Hydration 2.0 Backpack is a perfect hydration solution for hiking, trekking and travel. View More In Hydration Packs. If you have any questions about this product by Pentagon, contact us by completing and submitting the form below. If you are looking for a specif part number, please include it with your message.